In 1886 an outcrop of gold was found in this area In response 100,000 people of all races and nationalities flocked to the area. In 1887, the government decided that the large quantities of clay in the area were suitable for brickmaking, and many landless Dutch-speaking citizens settled there, built shacks for homes and started making bricks. Thus, the area became known as Brickfields. Soon other working poor, Coloureds (mixed race) and Africans joined them. In the early 20th century it was lawful for people of color to own fixed property in the townships of Sophiatown, Alexandra and Gauteng (now parts of Soweto). As a result, there were many blacks who became landowners in these areas. In 1923 the parliament adopted the Natives (Urban Areas) Act to provide for improved conditions of residence for natives (Africans or blacks) in urban areas and to control their ingress into such areas. Pursuant to this legislation, the Johannesburg town council in 1927 formed a Native Affairs Department, which built over 10,000 houses and over 4,000 temporary single-room shelters or shacks for these people. After World War II there was a huge housing shortage for blacks in Johannesburg. In response there were many squatters camps illegally established and the government was forced to build emergency camps. These became the worst slums of Johannesburg. In 1948 the National Party won the general election and its government sought to establish apartheid to separate the country’s racial groups, but the Johannesburg City Council did not support the National Party and apartheid. In the early 1950s Parliament passed the Bantu Building Workers Act for blacks to be trained as building trade artisans and the Bantu Services Levy Act imposing a levy on employers of black workers to finance basic services in Black townships. Under this scheme the Johannesburg City Council built over 6,500 houses, the best of which were 5o feet by 100 feet on 30-year leases. On June 16, 1976, mass protests erupted in Soweto over the government’s policy of enforcing educations for blacks in Afrikaans, rather than their native languages. A march of 10,000 students from a high school to nearby Orlando Stadium was met with armed attacks by police, killing an estimated 700 students. In 1983 the central government converted Soweto to an independent municipality with elected black councilors, but they were not provided the necessary funds to address housing and infrastructure problems, and the black counselors were seen as corrupt collaborators. Resistance to the central government also was strengthened by the exclusion of blacks from the revised national legislature. There were educational and economic boycotts. Street committees were formed as alternatives to the state-imposed structures. In 1985 the African National Congress (ANC) issued a call to make South Africa ungovernable, and many activists left the country to train for guerilla resistance. The Soweto Uprising and the aftermath had an enormous impact on the country and the world. It led to economic and cultural sanctions from abroad. However, the resolution, in an obvious effort to secure backing from the U.S. and other Western delegations and achieve unanimity, did not call for punitive measures, and the U.S. delegate at the session while condemning apartheid said the resolution should not be understood as indicating the U.S. was prepared to support punitive measures. Regina Mundi is the largest Roman Catholic church in South Africa. Set in Soweto, its current building was opened in 1962; its A-shaped roof covers a large interior that can hold as many as 2,000 people as shown in the photograph below. 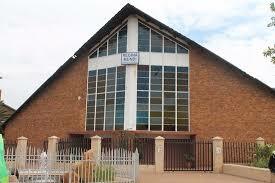 During the Soweto Uprising, many students fled to this church. The police followed them inside and fired live ammunition. No one was killed although many were injured and the church itself was damaged, and today both the interior and exterior walls still have bullet holes. After the end of apartheid, from 1995 to 1998, several meetings of the South African Truth and Reconciliation Commission, chaired by Archbishop Desmond Tutu, were held at this church, and in 1997 President Mandela established November 30 as “Regina Mundi Day” to honor the church. 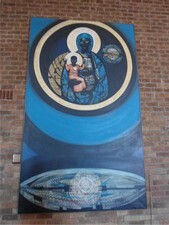 “The Madonna and Child of Soweto” (a/k/a “The Black Madonna”), as shown below, depicts a black Virgin Mary holding baby Jesus (also black) that was created in 1973 as part of a campaign to raise funds for the education of black South Africans. 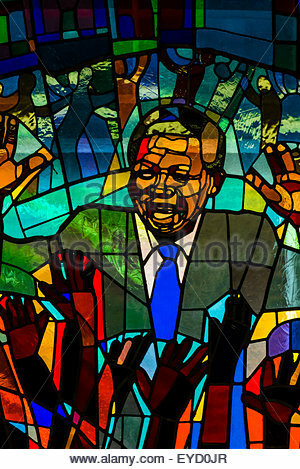 A stained-glass window with an image of Nelson Mandela, as shown below and on the cover of the Minnesota Orchestra’s Sommerfest Program just before its South African tour. The population today is estimated as roughly 1.3 million, who overwhelmingly are black and who speak all 11 of the country’s official languages. Soweto, Wikipedia; Soweto Uprising, Wikipedia; United Nations Security Council Resolution 392, Wikipedia;Telysch, Pretoria Regime Assailed at U.N., N.Y. Times (June 20, 1976); Regina Mundi Catholic Church (Soweto), Wikipedia); Regina Mundi Roman Catholic Church.